An inflorescence is a group or cluster of flowers arranged on a stem that is composed of a main branch or a complicated arrangement of branches. Inflorescence can also be defined as the reproductive portion of a plant that bears a cluster of flowers in a specific pattern. Inflorescences are described by many different characteristics including how the flowers are arranged on the peduncle, the blooming order of the flowers and how different clusters of flowers are grouped within it. 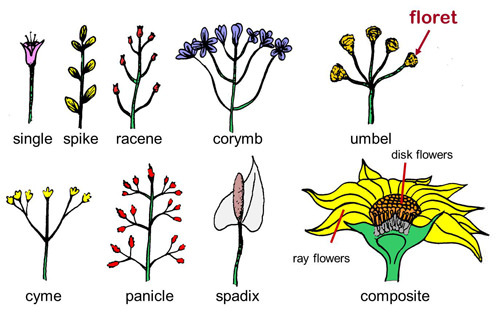 These terms are general representations as plants in nature can have a combination of types. Cyme – A determinate, flat or convex flower, with inner floret opening first.